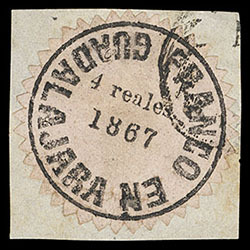 Guadalajara, 1867, 4r black on rose, serrate perfs, first period, tied on piece by Guadalajara oval cancel, full serrates, Extremely Fine, very few exist; with 1995 M.E.P.S.I. certificate. 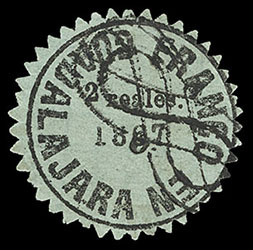 Guadalajara, 1867, 2r black on green quadrille, serrated perfs, second period, fancy mute handstamp of Ciudad Guzman (Schatzkes 343), Very Fine; with 1997 M.E.P.S.I. certificate. 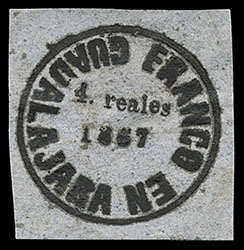 Guadalajara, 1867, 4r black on blue thin wove, third period, traces of o.g., full margins, Very Fine, a very scarce stamp; with 2003 M.E.P.S.I. certificate. 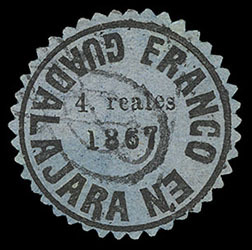 Guadalajara, 1867, 4r black on blue thin laid batonne, serrate perfs, third period, fancy mute cancel of Ciudad Guzman (Schatzkes 343), Very Fine; with 2003 M.E.P.S.I. certificate. 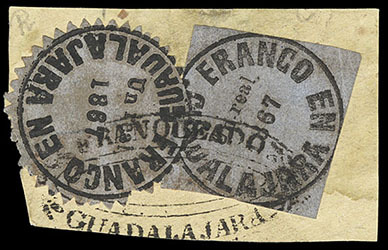 Guadalajara, 1867, 1r black on blue, in combination with 1867, 1r black on blue, serrate perfs, tied on piece by Guadalajara oval handstamp (Schatzkes 296), couple small serrate flaws, otherwise Very Fine, certificate states that it could also be Sc #17+19 or some combination of both, nevertheless a very rare third period combination; with 2002 M.E.P.S.I. certificate. Scott No. 35+37 Estimate $200 - 300. 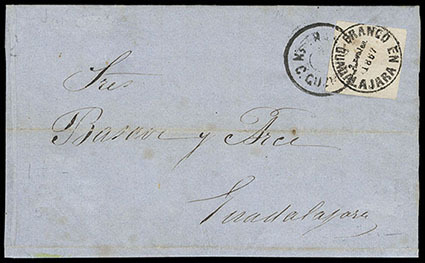 Guadalajara, Provisional Balance, with 18 stamps, 4 MEPSI certs, one GP very nice cover with Sc GP#6 and a cover with a 2r Eagle with the same cancel that originated the GP issue, it includes the rare Hosteopaquillo cancel with one of the MEPSI certs. 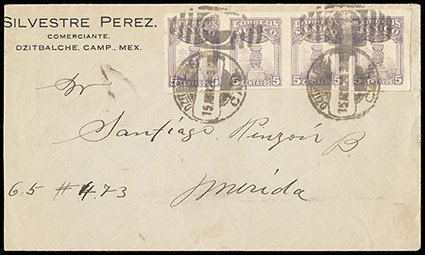 Yucatán, 1924, 5c violet, horizontal strip of 4, tied by 1924 Dzitbalche duplex postmarks on corner card cover to Merida, receiving backstamps; cover a bit reduced at left, F.-V.F., a rare usage from Dzitbalche. 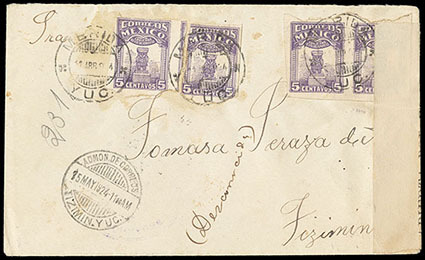 Yucatán, 1924, 5c violet, two pairs, one roughly separated, tied by 1924 Merida cds's on censor cover to Tizimin, with receiving cds and reverse with "Lista" handstamps, F.-V.F., covers of this issue are rare.